A lyrical exploration of one lonely boy’s search for home and safety, “Lean on Pete” follows the 15-year-old Charley (Charlie Plummer), as he seeks a fresh start at a local, small-time racetrack in Oregon, working for a down-on-his-luck horse trainer Del Montgomery (Steve Buscemi). 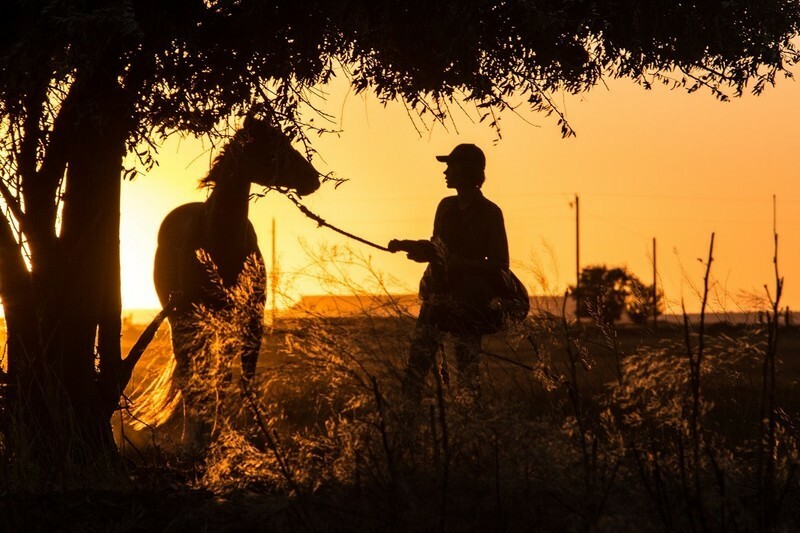 Befriending a horse named Lean on Pete just as helpless and ill fated as himself, Charley one day embarks on an epic, dangerous journey with the horse, looking for food and shelter across America, eventually heading to the home of his Aunt, whom he didn’t hear from in years. Along the way, he encounters dead-ends, heartbreaks (one, quite unbearable) and various people just as vulnerable as he is. Yeah, and I used to get really upset [while reading] the book. And afterwards I would sit around and I talk about it to people. What really upset me about Charley is that unfairness. There are a few wrong tracks that he takes along the way, where you could say, "You shouldn't do that, Charley." But at the heart of it, he has such awful luck. And he's in such a bad situation. And there's a lack of [compassion] in his world. Coming to that region from far away, how did you get yourself familiarized with that world? It all felt so authentic and believable. Thank you. It’s so important to me, the authenticity of a film. I spent about four-five months out in the area. I spent time with the writer of the book [Willy Vlautin] and I went to spend time at the horse track. I met jockeys and trainers, and went to little local horse races around Oregon. And I drove. It probably took about two or three months; I drove slowly across America, all the way to Denver. And then from Denver, I carried on going outwards all the way to Wyoming and Dakotas into Montana, and spent a long time on the road writing the first draft of the script, just looking around, keeping my eyes open to feel a bit more of the world as it felt around there. Did Willy Vlautin read your drafts? Each time I finished a draft, I sent it to him. I was terrified the first time I sent it. It's a big thing for a writer to say, "Yes, you can do this." I was like, “Okay, I don't want to disappoint him." And he was really helpful; sometimes, he would even make suggestions about, "You know what? I love this scene in the book, and it's there for a reason, but I don't think you need it in the film." So, he was very good at stuff like that. And also, he would be like, "I don't think that sounds quite how a horse trainer would say it.” He was on-set a lot, not saying anything, just sitting. He was such a lovely guy. He's a good friend of mine now. Sometimes I could see him tearing up in the monitor watching his character come to life. During your time in the region, I'm sure you met a lot of people and heard their stories. I think it's very easy to have an assumption of what people are like, and judge people very quickly. Especially because of the way the world works now, we can judge people incredibly quickly. And there's no denying the truth that some of the characters, if they were real in this story, would have ended up voting for Trump, for example. It’s always very important that you can completely disagree with someone, but it doesn't fundamentally mean that they are bad people. You go to those places, and there is a huge amount of struggle economically. So I wanted to approach all of the characters with some sense of kindness. Even if I might disagree with things that they do or say politically, that you have to try and have sympathy for everybody. I'm not one of those people that's like, "They're all idiots." I'm one to try and understand the situations. In a way, almost all characters in the film are like Charley, barely getting by from day to day. And you captured that really respectfully. For me, it was always [about] the notion of being abandoned. Charley, on a personal level; but on a wider scale, communities being abandoned and not being helped. Whether it's Charley by his dad or whether it's people by the government. And everyone's to blame. And you see so much sadness and suffering. So, it was important to me that in the backdrop of the story, those kinds of stories emerged a little bit, without overpowering it. Something else emerged for me too, perhaps a bit surprisingly. I think this film subtly says something about gender, and the perception of gender. There's the ‘absent mother’ character--her absence is the origin of it all, in a way. And a mother being gone, as voiced by a character, is unusual. Then there is the aunt who doesn’t contact Charley. And there is the abused young girl. Plus, of course, there is the female jockey who talks about her difficult experience of being a woman in a man’s world. Did this thread occur to you as you were writing the film? Yeah, I think it did. [Through] the way I've grown up and [because of the] things happened to me in my personal life, I am weary of traditional ideas of masculinity and femininity. Strict gender [norms] make no sense to me. So, naturally, when I approach characters, I want to look past [the] traditional version of gender. The men in my films are not traditionally [masculine]. Charley's not a traditionally masculine version of a kid. Tom Courtenay in “45 Years” is not a traditionally angry, masculine man. And the same with my female characters. I hope that there is some nuance that I'm dealing with there. Men are both bad and awful. And women are both bad and awful. And they can both be good and wonderful on both sides. As a female viewer, that's something that I always look for in a story. And the fact that his mother had left is very interesting. In my own life, my parents divorced when I was young. I lived with my dad, not with my Mum after they got divorced. And it's been part of my life. And I find that very interesting part of the story. It's still not a regular occurrence to happen. And I like that Charley doesn't hate his mom. When he talks about her, you can feel that pain and that desire that he wishes she was still there. Charlie Plummer has such a soulful on-screen presence. I just kept thinking of River Phoenix somehow. His face did much of the heavy lifting in quiet moments. He has that soulfulness and that sensitivity. Talking about masculinity again, I think there's a lack of sensitivity sometimes in [male] actors. Or people don't want their male actors to be sensitive and soulful. River Phoenix absolutely had that. And then you watch someone like Charlie and [see the] tenderness to him. I'm drawn towards the way he approaches a scene and his face. I want to understand him. He's also not giving everything away. He's like pulling you in and pushing you away at the same time. He does remind me of Charlotte Rampling—it's so odd. They're very different people, clearly. But as a performer, they're inviting you to look, but they're not telling you everything. So, they say, "You can look at me. You can watch me. You can try and understand me. But you aren't me. So, I'm not going to give you everything." And I always like that in [a] performance. I love that analogy. I was already thinking of a through-line between “Lean on Pete” and “45 Years” actually (perhaps even “Weekend” too, to a degree.) The lead characters accumulate so much emotion inside of them over a short period of time, and we don't really see them cry until the end. Right. It's a very easy thing to do, to have someone cry in a movie [and assume that] you will have empathy for them straight away. But I never get it when I watch other movies. If I see someone break down in tears, I don't necessarily feel empathy for them in those moments unless it's really warranted. I feel like a tear needs to be warranted in a movie, it needs to be earned. Even in “Weekend” I guess, it feels like we're finally given a real emotional glimpse into [the character’s] soul. But it takes time to know somebody. It seems like you prefer stories set within a limited timeline, during which your characters need to move from A to B. You play with amplified emotions during a condensed amount of time. Yeah, I absolutely am interested in that. I get sent some scripts sometimes [that go] backwards and forwards in time. My head goes, “I don't know how to approach this, it doesn't make any sense.” There's something about limited time. I just feel like a film is seeing something, seeing someone's life over a short amount of time. And then I want you to leave their life, but really feel like their life is just continuing. It's going to take on and continue, and then we'll think about that in our heads. [Thinking] how quickly your life can change in a small amount of time [is essential]. In "Weekend," he can meet someone in a weekend and he's forever changed, even if he never sees that person again. In a week, a relationship can break down. And this film is set over two and a half months, but still he goes from being in one situation with his dad to being homeless. And life in general is made up of those defining moments or periods. Absolutely. [I’m interested in] how we, within those moments, get through [things]; how we change or don't change. I think we have a core way of being and that doesn't change that much. It's about how we are affected when things are thrown at us. I think all of my characters are actually pretty passive. They're not active, traditional story characters. I think we're pretty passive in our lives. We are clinging onto an idea of who we are and we hope that it's not destroyed as things get thrown in our way. And then we deal with things, and then we move on, and then we deal with things and move on [again]. And we try to do the best that we can. People in this story don’t really have the luxury of thinking long-term anyway. They’re just looking to get to the next thing. I notice in your films that your camera stays at a respectful distance from your characters. And this is evident in “Lean on Pete” in a number of scenes, especially when the father-son are around the table, eating, and you're behind the door looking in. Yeah, I've tried sometimes not to do it like that, but it just [feels] wrong to me. Like for that scene in the kitchen, I did shoot something closer. And the minute I saw it, I [said], "It just doesn't make sense." For me, it's all about slowly getting to know the characters. If I'm in this [close] space to start with, it doesn't work. I feel like I'm intruding. I want us to feel like onlookers. I don't feel like you can ever truly understand how someone feels. The truth is, we can't [really] have empathy for lots of people, because we don't know how they feel. But what you can have is compassion. I want my camera to be a bit more objective. I want you to feel for these people without thinking that you are this person. For me personally, [it] works on a more emotional level, and on a philosophical level. Sitting around a table and eating food and having conversations was a big part of this movie. If you don't have enough money to buy food, food becomes incredibly important. And so whenever there is food, it becomes a big thing for Charley. It’s so easy for us to forget that. So, when he gets free ice cream from that waitress, and there's that fortune cookie … I love that scene. It breaks my heart that it's just someone giving him some ice cream, but for him, it's amazing. It's a real act of kindness. 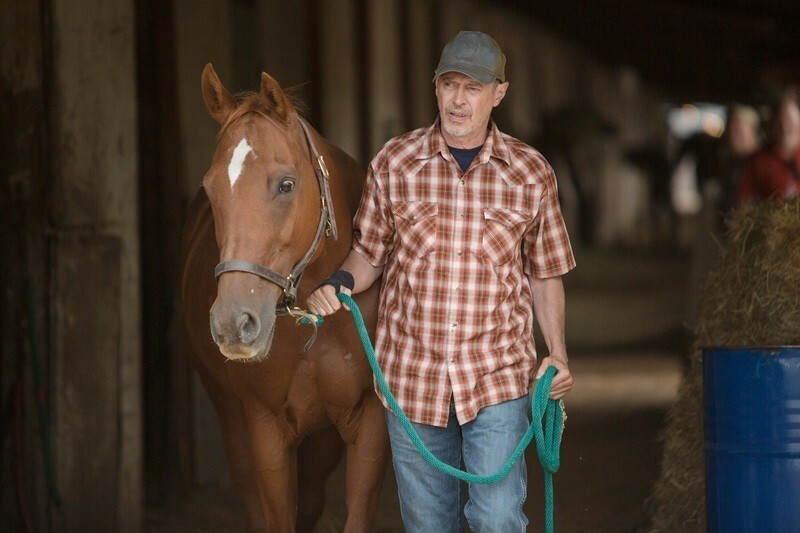 Switching gears a bit … I would love to hear about how you worked with the horses in the film. [The trainers] were so good. You go through the script with [them], and they say, "What do you want the horse to do in this scene?" And then you say, "I need it to be agitated," or whatever it is. And then they train it in a certain way to be able to get that reaction without actually agitating the horse. The harder thing was, almost on a daily basis, realizing you have horse in a scene. That's a big animal. So often, you would have a shot in your brain, then you realize, "Oh, well I can't do that because Charley can only walk the horse from one side." You can only lead them from one side. So, my shots would often have to change. [The accident scene with the horse is] one shot essentially, but we shot it over two nights. It was tough. And there are a few other shots in the film that were [technically] similar: there's a scene where Charley runs out of the stadium and the horses race past him and Pete loses. It's all one shot. You can't race the horses more than once, because they get tired. So, you've got only one chance of getting it right. So we had to get [those technical shots] right. We would rehearse endlessly and hope that it works. The sound design of the accident scene was exceptional. The sound Pete made … it broke my heart. The sound designer found those sounds. He’s great—we did “45 Years” as well. Sound to me is always so fundamental. In a sequence like that, it is more important than the imagery, mainly because you can't hide your ears from hearing it. It has a lasting effect, as you say, that can resonate longer than pictures can sometimes. You don't want to hear animals in pain. It's about fear. I think an animal can be just as fearful of his own demise as us. How did you cast and work with Steve Buscemi? I think he's making [fewer] films [these days]. So he's even more interested in the choices that he makes. We sent him the script and he just really liked it. He always makes really interesting choices. When I met him, we just talked about it, and about the John Huston film, “Fat City.” I'd never actually seen it. I went and saw it afterwards, and I completely understood: it's a very grounded version of a sports movie that's about boxing. [Steve] never wanted his character to be clichéd; either a cantankerous horse trainer, or a stand-in father figure. I loved his performance. It really feels like of the Earth and that world. He's all of those things, both good and bad, and struggling with his own problems in life. Likes Charley, cares about Charley, but doesn't have enough time in his life to care for him. What you said is interesting. I thought maybe he’d become a clichéd father figure eventually, but the story didn’t go there. He departed, like everyone else in Charley’s life. Yeah, and they drift out of his life. I mean, Pete maybe leaves his life a bit more dramatically, but the other characters drift in and drift out. And that felt very truthful to how people do come into our lives and become very important for a small amount of time. Then they sort of drift away and then you never see them again. I noticed an evil eye charm in Del’s car. I'm Turkish, so I was like, "Oh gosh, where did this evil eye come from?" That's so crazy. It must be the production designer. What does it mean? It’s basically a protective charm from bad luck and from people who might have ill thoughts towards you. So I just thought; it fits right into this world of vulnerable people. I kept reading into it. [We wanted] every character to [seem] powerless, basically. And nobody’s life in the story is going well. Constantly, they're being fated bad luck, bad situations, and economic problems. And all of them are looking for some kind of protection. I'm going to pretend that it was completely my idea. Yeah. [Laughs] “I've been to Turkey, and I remember it, and it was completely planned,” is what I'm going to say.